McCabe-Thiele diagram—stepping between VLE curve and operating lines to estimate number of trays required same procedure is applied again to the first tray. yy is determined from (move vertically to the VLE curve). x2 is determined from yv by moving horizontally to the stripping operating line. This stepping procedure is continued up through the stripping section until the intersection of the operating lines is passed (see Figure 2.24). This determines the number of trays required in the stripping section. Then the rectifying operating line is used, and the stepping is continued until xD is reached. The number of trays in the rectifying section can be determined in this manner. Thus we can design a column (i.e., calculate the total number of trays Nr and the feed tray NF) using this graphical technique, having specified product compositions and operating line slopes. As we will show in the next section, the operating line slopes are both known if the feed thermal condition and reflux ratio have been specified. The feed to a distillation column can be liquid or vapor, or both, depending on the temperature, pressure, and composition of the feed. To quantify the thermal condition of the feed, the parameter q is defined as the fraction of the feed that is liquid. If the feed is a saturated liquid at its bubble point, q = 1. If the feed is a saturated vapor at its dew point, q = 0. If the feed is a vapor—liquid mixture, q is a fraction. Values of q greater than 1 indicate subcooled liquid feed. Values of q less than 0 indicate superheated vapor feed. This is the equation of a straight line with slope (~q/( 1 — q)). It is called the q line and intersects the 45° line at zF. Thus the intersection of the operating lines must lie on the q line, which can be easily drawn given zF and q. Figure 2.25 shows q lines for several values of q. The slope of the rectifying operating line (LR/VR) can be expressed in terms of the internal reflux ratio LR/D = R. If the reflux is a saturated liquid at its bubble point,* LR = L0. Thus the rectifying operating line can be drawn if xD and R are specified. It is a straight line with a slope of R/(R + 1), intersecting the 45° line at xD. Then the stripping operating line can be drawn if xB and q are specified. It is a straight line joining xB on the 45° line with the intersection of the rectifying operating line and the q line. 4. 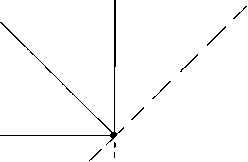 Calculate slope of q line ( — q/(l — q)) and draw q line from zF point on 45° line. 5. Calculate B and D from overall balances [equations (2.25) and (2.26)]. 6. Calculate liquid and vapor flow rates in rectifying and stripping sections. 9. Draw stripping operating line from xB point on 45° line to the intersection of the q line with the rectifying operating line. 11. 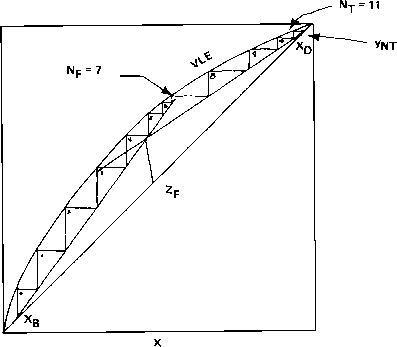 Start from the xB point on the 45° line and step up the column from the stripping operating line to the VLE curve. The first step corresponds to the partial reboiler. The next step is tray 1, the next is tray 2, and so on. 12. When this stepping procedure crosses the intersection of operating lines, this is the "optimum" feed tray (i.e., any other feed tray would require a greater total number of trays). Thus the feed tray NF has been determined. 13. Switch to the rectifying operating line and continue stepping. 14. When the xD point is crossed, this is the total number of trays NT. This last step will not go through the xD point exacdy, implying a noninteger number of trays. Don't let this worry you. In this procedure we have assumed "perfect" or "theoretical" or "100 percent efficient" trays; that is, trays on which the vapor and liquid streams leaving the trays are in perfect phase equilibrium. Actual industrial columns seldom achieve this ideal situation, so an efficiency factor must be used to determine the number of actual trays installed in the column (which must be an integer number). Typical efficiencies run from 40 to 90 percent, depending on the system. The graphical McCabe—Thiele methods studied in the previous sections for the design of distillation columns are also widely used to analyze the operation of an existing column. In this case the total number of trays in the column NT is fixed. The feed tray may also be fixed, or, if there are multiple feed points available on the column, it may be varied. These fixed-column problems are called "rating problems," as opposed to the "design problems," in which NT is calculated. Both of these calculations involve iterative, trial-and-error solution techniques. Basically one guesses a solution and sees if the stepping procedure produces exactly the same number of trays in each section as has been specified (see Figure 2.26). Notice that in both of these problems, two variables must be specified to define the system completely. This magic number of two occurs again and again in distillation (see Section 4). It is often called the "degrees of freedom" of the system. Mathematically the two degrees of freedom are the result of subtracting all the constraining equations describing the system (mass, component, and energy balances; VLE equilibrium relationships; and specified variables) from the total number of system variables. 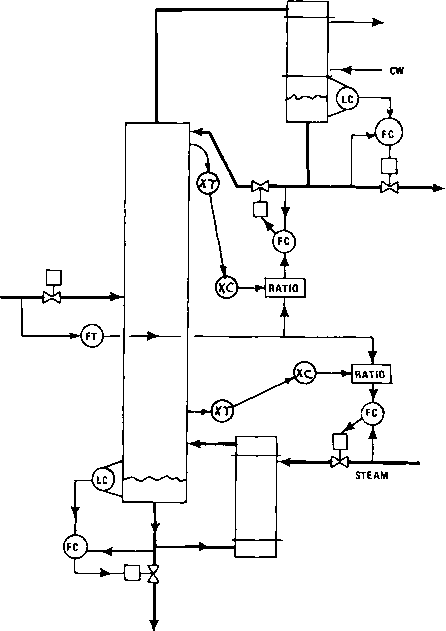 McCabe-Thiele diagrams are useful for getting a clear picture of some of the limiting conditions on the separation that can be achieved in a distillation column. How do u do material balance given the mass % ,feed value and reflux ratio?